Be the first to share your favorite memory, photo or story of Eva. This memorial page is dedicated for family, friends and future generations to celebrate the life of their loved one. Eva Hounshell, 88, Jackson passed away Friday, April 5, at the Wolfe County Health and Rehab Center in Campton. She was the widow of the late Raymond Hounshell and the daughter of the late Letcher and Jessie Baker Sandlin. She was also preceded in death by one son, Wilgus Stamper. 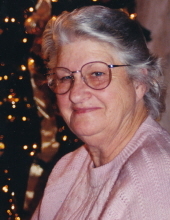 She is survived by two daughters, Sue Dunn(Andy), Norma Schantz(David); one daughter-in-law, Joyce Stamper; one brother, Earl Sandlin; one sister, Brenda Fisher; three grandchildren, Patrick Dunn, Todd Church(Teresa), Venessa Birch(Chuck); four great grandchildren, Gabi, Erik, Becky, Dillon; one great great grandson, Bentley. Visitation, Sunday, April 7, 5PM. Funeral Monday, April 8, 3PM with Rev. Armon Nichols officiating. Burial in the Hounshell Cemetery at Jackson. To send flowers or a remembrance gift to the family of Eva Hounshell, please visit our Tribute Store. "Email Address" would like to share the life celebration of Eva Hounshell. Click on the "link" to go to share a favorite memory or leave a condolence message for the family.